One of the cruelest aspects of summertime in Houston is that it lasts so late into “fall.” When considering the average high temperature, the peak of summer for most of the United States comes in July—on average July 23rd for the lower 48 states. This is understandable, as the Sun reaches the highest point of the sky in late June. 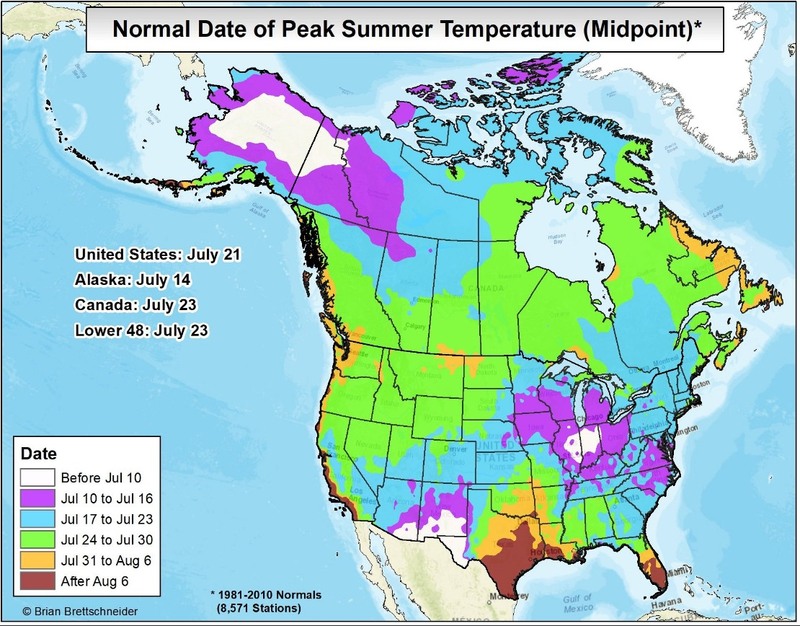 However this is not the case for much of Texas, and especially the Texas coast, where the peak of summer typically comes during the second week of August (see map below). The primary driver of this latent heat, of course, is the Gulf of Mexico, which takes a little longer to warm up in late spring and early summer, and therefore takes a lot longer to cool down in August and September due to slightly shorter days and, eventually, cool fronts from the north. As a result Houston “enjoys” peak heating well into the month of August while the rest of the country begins to cool down. This is a good day to discuss peak heating because some areas of Houston this week will have an outside shot at hitting 100 degrees for the first time this year. Aside from the local excitement over Tropical Storm Cindy, the 2017 Atlantic Hurricane Season has been a quiet one for Texas. That’s not surprising, as about 90 percent of all tropical activity during a given season occurs after this point during hurricane season. Basically, then, June and July are often just a prelude for the heart of hurricane season—August and September. And as we get close to August this year, a key signal suggests busier days may lie just ahead. One measure of this activity in the atmosphere is “potential velocity,” which is rather complicated to compute, but essentially this is a useful indicator of rising air and a better chance for tropical systems to form. 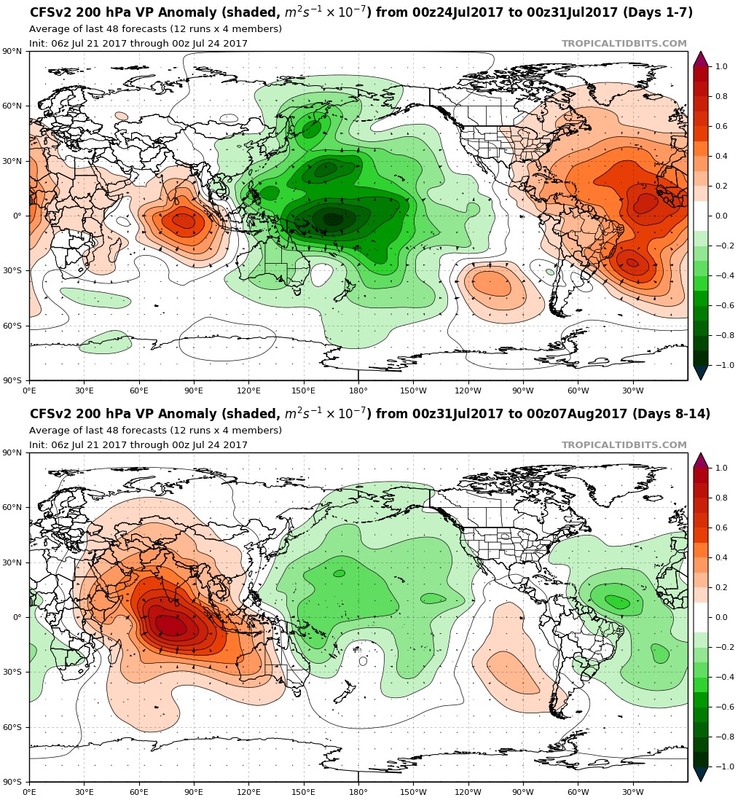 In the graphic below, we can see the potential velocity (VP) anomaly for this week (top), and the first week of August (bottom). Note the dramatic shift from a positive anomaly (which is bad for hurricanes) to a negative one over the tropical Atlantic, between Africa and the United States. This does not guarantee the development of a hurricane by any means. But it does suggest that as we approach the traditional peak of hurricane season, meteorological factors may also be improving for storm formation. In any case, it is the time to make your final preparations for hurricane season. Now, onto the forecast. 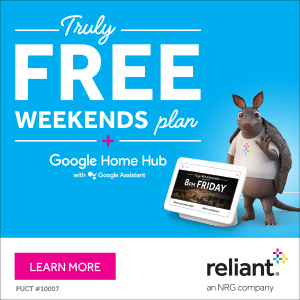 Heat continues, plus SCW featured in Houstonia Mag! Before we dive into the forecast, just a quick note. Eric and I were interviewed by Houstonia Magazine for their August issue. In it, we give answers to some of the most common weather questions we get about Houston and our “crazy” weather, as JJ Watt so aptly put it on Wednesday. Besides our Q&A, the issue looks like it’s going to be fantastic, with articles and lots of cool pictures from weather events of the past throughout the Houston area, so be sure to check it out and pick up a copy! Houston’s high summer continues, with a lot of repetition in day to day weather around the area. I expect that today will look a lot like yesterday. However, I wouldn’t be shocked if we see a couple more showers and thunderstorms in the afternoon or evening, especially south and well east of Houston. Large scale high pressure in the upper atmosphere to our north weakens considerably day over day, which should at least offer up a more favorable atmosphere for storms. That said, I’m not sure we quite have a trigger in place for too many more of them just yet. Either way, it looks hot and humid again today, with highs in the mid-90s in Houston. Yesterday and Wednesday were officially the two hottest days of summer so far, with high temperatures of 97° both days at IAH Airport. For Saturday, upper level high pressure weakens even more, and we add an upper level disturbance to the mix. This combination should allow for much greater coverage of storms than we’ve had late this week. I don’t think Saturday ends up a washout or anything, but the odds that you’ll have to dodge some raindrops and lightning for a period of time are elevated. Be prepared to find some indoor shelter for a bit Saturday if you’ll be outdoors. Likewise, Sunday should see that upper level disturbance overhead or nearby, leading to healthy coverage of showers and storms with daytime heating. With clouds, showers, and a generally cooler atmosphere, temperatures this weekend will be held down. Expect an average of lower 90s in the city, hotter northwest with lower rain chances and cooler southeast with higher rain chances. One of the finest football players of his generation, J.J. Watt, may have been drafted by the Houston Texans in 2011. But on Wednesday we can safely say that he truly became one of us, for he has grasped one of the core truths about living along he Upper Texas coast. Watt, presumably, was caught in one of those isolated downpours on Wednesday that deluged a small area of the city, while a block away it was perfectly sunny. Houston lies on the southern periphery of a high pressure system, and therefore rain showers will likely be few and far between to end the work week. There’s still enough moisture to produce a few downpours, but for the most part the bigger story is going to be heat, with highs in the mid-90s and humidity pushing the heat index over 100 degrees. These days will be very warm, so prepare for outdoor activities accordingly.